Flushing Savings Bank is spreading the holiday cheer with their current Christmas promotion. It seems that customers stand a chance of getting gadgets such as an iPad 2 and more, if they open a certificate of deposit account with Flushing Savings Bank. All you have to do is complete the easy online application and you can have those gifts immediately delivered to you. Although the gift package sounds simply irresistible, one thing any smart investor would look at is the CD rate offered. Right now, their 5 year CD is featuring a 1.75% APY rate which isn’t bad at all since it is considerably higher than the national average at 1.19%. However, there are other institutions who can offer better rates such as 1.95% from Nationwide Bank and even as high as 2.68% from Melrose Credit Union. For those who don’t have the capacity to make such a large deposit of $25,000 for a 5 year term or those who want to deposit more, there are other gifts available every deposit range and term. Other gifts available are the Casio EXILIM 14.1 MP Digital Camera and Amazon Kindle for $5,000 – $9,000 deposits, Nintendo DSI Package and Samsung HDTV and Bluray Player Package for $10,000 -$24,000 deposits, Samsung 3D TV Home Theater and Canon EOS 7D Kit for $50,000 – $99,000, and Royal Caribbean Premier Cruise, Ultimate Samsung Entertainment Package and Solana Portable Spa for $100,000 – $250,000 deposits. There are more gifts in store, depending on the amount deposited and the CD term availed. Flushing Financial Corporation is the parent holding company for Flushing Savings Bank and iGoBanking. The bank is located in Queens, Brooklyn, Manhattan and Nassau County but was able to widen its reach with the opening of their online arm. FSB is insured by the FDIC. These gifts from Flushing Savings Bank are sure to be part of your wishlist this Christmas. So instead of going out and buying them, you can get them for free in addition to the investment you’ve just made. 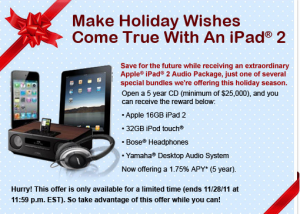 Promo ends on November 28, 2011.